I was going to be a Royals homer and feature my favorite catcher in the world, but a Facebook friend recommended I look in the direction of Eden Hazard and suddenly I’ve got soccer hotties on the brain. Kickette.com featured this first picture of Theo yesterday and I decided this cutie needed more exposure. Those of you not into footy are missing out on this adorable young’un. He plays for Arsenal and the English National Team and has some gorgeous eyes. He’s adorable in that friend’s younger brother sort of way. And he rocks some serious ear bling. I stand by my theory that if he’s rocking good jewelry, he must hook up his lady friend with all kinds of ice. Follow the jump for Theo in a suit and some gorgeous legs. You knew that we couldn’t get too far into the ACoH without me starting to find some soccer hotties to send your way. You should all appreciate that I didn’t post more gratuitous Fernando Torres pictures. It was hard, but I spend long hours scouring to find you knew and adorable soccer players. 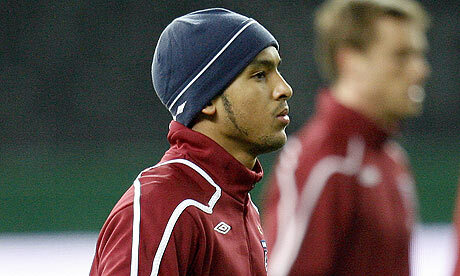 This is Curtis Davies who plays for Aston Villa in the English Premier League. Not only does Mr. Davies have a charming smile, but he’s rocking some Louis Vuitton luggage. If he buys that for himself, imagine what his woman would get to carry! Thanks to Kickette for the pic! A tale of two teams. In the immortal words of Song #2: WOO HOO! Team A won their 11th Premiere League title just last season. (The second, mind you, in a row.) They’ve been essentially unstoppable for years, and you can always depend on them to be at the top of the standings every year. They’re the Yankees of the Prem League, in essence. Anyway, Team B is finally promoted. They’re going to get to play with the big boys again. What do the scheduling Gods do to them? Naturally, schedule them to start against Team A. The pictures do get better. Mostly. About a year ago, thanks to a tip from Henry Abbot, I wandered a few blocks down from my work to watch Steve Nash, Thierry Henry, and a number of other NBA and soccer stars play a charity soccer match in a tiny park in Chinatown. It was so entertaining, I decided to do it again.